Lest there is any doubt left in anyoneâ€™s head, Iâ€™m a process knitter. Just like all knitters, I love to shop at my local yarn shops and feel all of the wonderful fibers and dream about knitting with them. But the finished objects I create are much less important to me than the simple act of making loops with a couple of sticks in new and interesting ways. 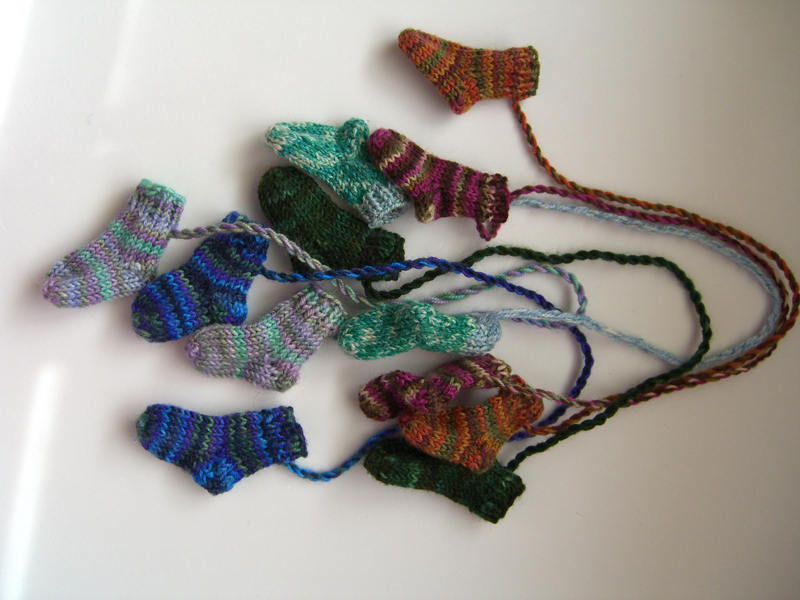 Having to make two of anything is anathema to me – which is why I knit socks two at a time, and why I ended up knitting 12 teeny little socks all at once. Iâ€™m a process knitter. I donâ€™t at all mind frogging something out if I donâ€™t like how it looks. I like having finished objects to wear and use. But itâ€™s the act of getting there thatâ€™s important to me. It is the journey, not the goal. I am a process knitter. I often use a single-crochet bind-off on my toe-up socks. Itâ€™s stretchy and easy to do. But sometimes I donâ€™t have a crochet hook with me. Reasoning that there are only so many ways that loops can be made, and whether the loops are made with sticks or hooks is rather immaterial in some cases, I spent 20 minutes the other day figuring out how to do a knitted â€œcrochetâ€ bind-off. It looks identical to the actually crocheted version. For me, itâ€™s even stretchier because my crochet can sometimes be tight. Iâ€™m calling it the â€œnon-crochetedâ€ bind-off. I may use it on the pattern Iâ€™m doing for Tangle. Or not. Today I mentioned to a non-knitting friend who has watched me knit a myriad of socks that I was going to design a sock pattern. Whatâ€™s a sock pattern? He asked. Casting around for a way to explain it in terms that he would get, this is what I came up with: Alice at Tangle gave me her business requirements [would you be interested in doing a pattern] and I responded with a feasibility study and a functional spec with options [showing him my test swatch with lots of different possible stitch patterns]. The preferred option has been agreed upon, and now I need to write a technical spec so that other knitters can create the finished product. The â€œsock patternâ€ is the tech spec. Oh, he said, I get it! I’ve found the pattern for my sock pal’s socks. 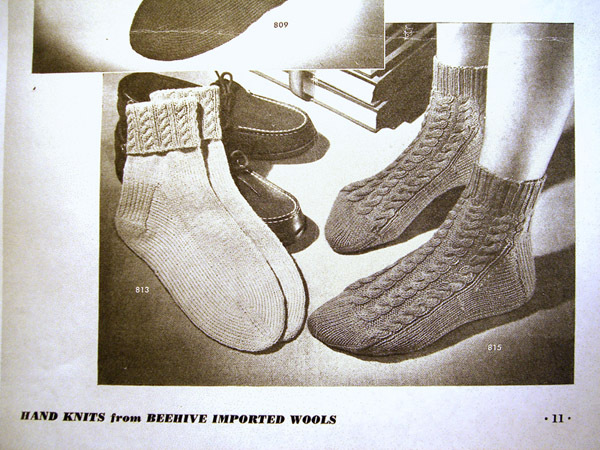 Alice from Tangle Knitting Studio in Lake Oswego let me look through her stack of old magazines and knitting books from the 40’s, and I found this in a little book called Hand Knits By Beehive – Socks For Men And Women. I’m going to make the ones on the right. Except I’m going to make them toe-up. And longer. But that’s the general idea anyway. I think they’re going to look great in that Ambrosia yarn. This is my next project, as soon as I get the basket weave socks off of my Inox grays. Which shouldn’t be too long, as I have the heels turned and have started up the ankles. For the second time. I didn’t like the way the heels came out the first time so I frogged and re-knit this weekend. I also need to get ready for my sock class that I’ll be teaching starting in just a few short weeks! EEK! And Alice has asked if I’d be interested in doing a pattern for Tangle’s anniversary. Which I am. But June isn’t all that far away, either. Maybe I’ll get that sweater done by next fall. I’ve been quiet the last few days because I’ve been out of town. I was invited to spend several days at Lincoln City with a wonderful group of women (and one wonderful girl). We had a marvelous time walking on the beach, shopping, eating, playing games and laughing. And, yes, some knitting was accomplished – although not much. The weather was amazing! Clear and very cold. On Saturday the wind was so strong it blew the waves up in spray. But the sunshine was so nice. 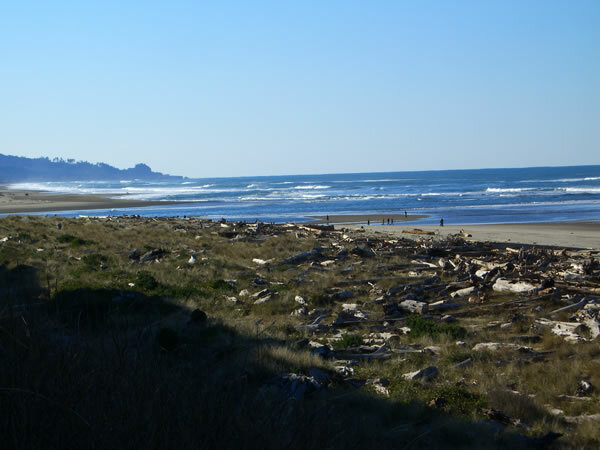 This picture is looking south toward Siletz Bay from just below The Inn At Spanish Head. You can see the rest of the pictures I took on the Galleries page under Lincoln City, 02/2006. We saw a spectacular sunset and sunrise from our rented house high over the beach. In the good news department, Dr. Specialist called me as I was on my way out of town. The tests showed only IBD and no sign of lymphoma. Yea! #1 Son was great at giving Kidd his medication and keeping him in Gerber baby meats while I was gone. Since I’ve been back, I’ve been tempting Kidd with all of the yummy cat foods I can find, in the hope that we can get him back to eating his regular food soon. Life is beginning to get back to what passes for “normal” around here. [ed.] I just realized that I typed “IBM” instead of “IBD.” That must have raised a few eyebrows. And what do you think a line of teeny, tiny socks is doing, hanging from my mantle? 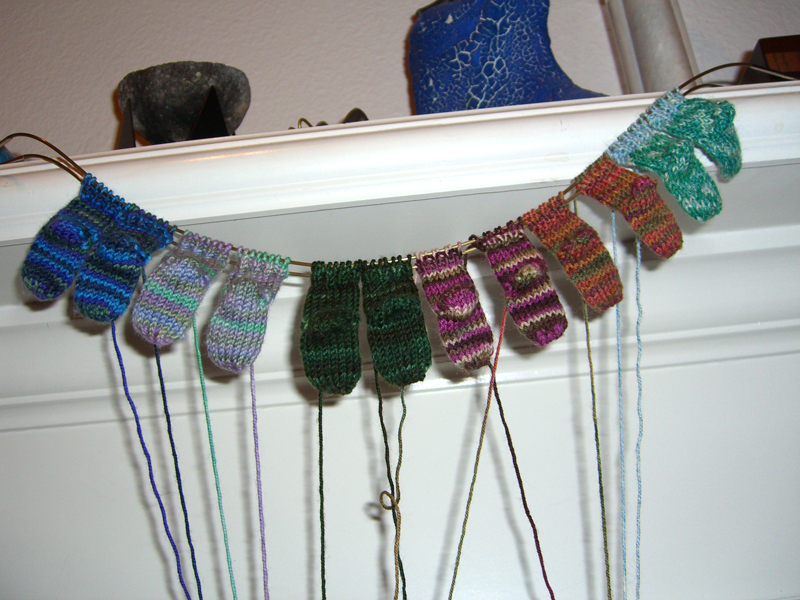 Those are 12 little socks, knit all at once on two size US#1 Addi Turbos. Personally, although I wasn’t competing in the Knitting Olympics, I really think I deserve an Honorable mention for this one! That’s 12 socks! Twelve! All at once! And, no, I didn’t manage to keep the yarn untangled, especially when I turned the heels. That was a mess. I’m not sure I would try this feat again. And what does one do with 12 teeny, tiny little socks? Why… turn them in to little sock bookmarks, of course! These are on their way as gifts to a special group of women. No word yet on Captain Kidd. I’m waiting for the results of the tests done on Thursday. The most likely diagnosis, it appears, is lymphoma. I didn’t hop on the Knitting Olympics bandwagon. Just too much to do. I am, however, working on a tiny little project that I think should qualify me for some sort of honorable mention. Pics hopefully tonight or tomorrow. At least tomorrow, because this project has to be finished before Thursday AM! Because Thursday afternoon I’m leaving for a couple of days down on the coast with some friends. All girls, no guys. Yep, #1 Son gets to stay home while Mom goes out and has some fun. That’s a first! I am now praying that there will be no snow in the Coast Range, since I have neither snow tires nor chains. The weather reports are indecisive. It could get interesting. No update on Captain Kidd. We should know more today either way. Terrorists and totalitarians have always been two sides of one coin; a totalitarian out of office is a terrorist.